BioFlex labret studs with tiny push fit Swarovski gem stones. BioFlex jewellery is ultra safe and can be fully autoclaved making it safe for the initial piercing. 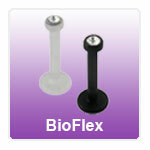 Check out our other range of BioFlex piercing products.